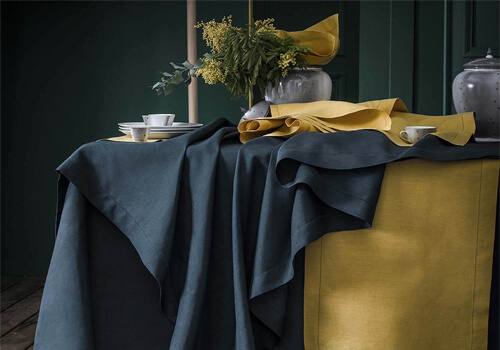 Linen is part of our DNA, we work with it since 1847, respecting the French traditional know-how, upgraded and modernized, to offer luxurious bed linen and table linen. This noble material is the oldest in the world and is still highly appreciated for its various properties. 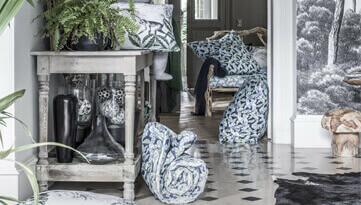 Let us give you an overview of this material often used to create our home linen collections. Linen is one of the first textile fiber crafted by men, for more than 30 000 years now. It was used by Egyptians to mummify pharaohs’ and then, was established in Northern Europe till the Middle Age. Nowadays, this natural fiber is still appreciated and the transformation processes are not much different from the ones developed by Romans. Linen fabric is made from the fibers growing inside of the stalks of the flax plant. It is cultivated in area with a temperate climate before receiving many handlings to reveal a great quality for home linen. To preserve the entire stalk length, flax is fully pulled out to collect the whole plant. Many steps happen before transforming the flax into thread: The seeds need to be removed as well as the waste from the stalk to, then, proceed to the retting. This process allows to remove the pectin holding the fibers in the woody portion of the flax plant. For this matter, we need to let dry the plant (pulled out) and let it rest in a wet place. 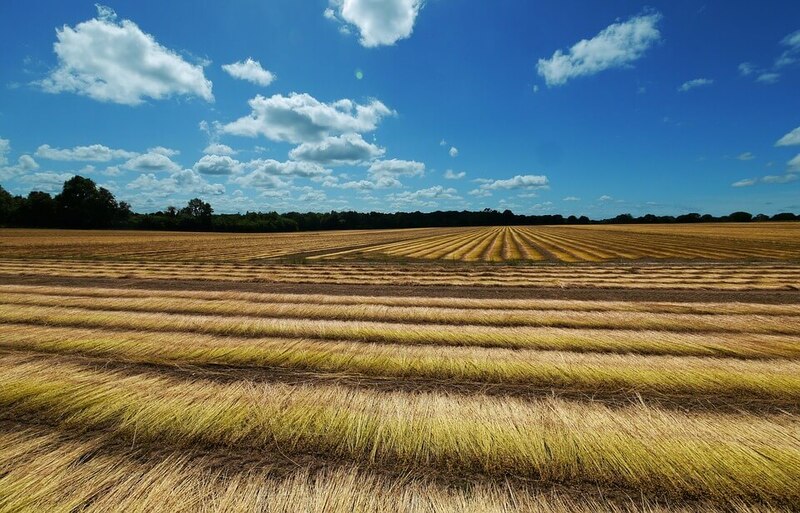 Usually, this is realized in the field so the flax can benefit from the land humidity, from the rain and from the watering. Then, it is time for the drying, grinding and scotching process to obtain an oakum with a length that can vary from 45 to 90cm. This oakum will finally be combed to be able to spin it. It is at this time that we separate the long staples from the short fibers. Finally, we obtain a combed linen of a beautiful quality. 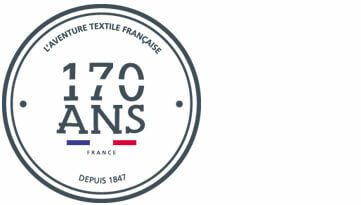 Its production is mainly made in Europe, and particularly in France. 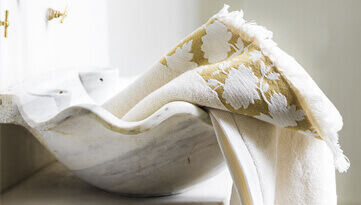 This noble and natural fiber is highly appreciated for its properties to create beautiful home linen. Eco-friendly, linen is the natural fiber the most respectful for the nature. It only consumes few amount of water and no fertilizer nor pesticides. This plant is fully used and its derivatives are recyclable for a preserved environment. Durable, its fiber is rigid and long. It provides highly resistant fibers to make high quality home linen. Linen fabric is not sensitive to warp and do not plush. Easy to clean, this vegetal fiber loves water. It becomes more and more beautiful after several washing cycles. It will be more beautiful, suppler and brighter because the small fibrils will be removed. Your Alexandre Turpault pure linen home linen can be washed in a washing machine without any issue, and will love to dry in open air. However, it does not handle the dryer which dries out the fiber and brutally wrinkle it. The linen will become suppler and suppler after each washing and ironing cycle. The fabric will then offer a natural tenderness and a surprising softness. Aesthetic; the dyed linen makes the colors brighter, even after several washing cycles. The drape of the linen fabric is superb, the pleated of the antic statues can testify. The unique alliance of several properties within the same flax linen fiber, provides a sensorial experience of a great comfort when you use our products. The hollow fiber, in its center, allows a great circulation of the air. Sleeping in our luxurious bed linen will be highly comfortable and will provide a great feeling of freshness. Linen allows your skin to breathe and regulate your temperature. Its hydrophilic property is twice more important than cotton. The luxurious bed linen made of pure linen absorbs the body humidity on the surface of your skin and quickly removes it. This provides a comfortable feeling with a pleasing freshness. 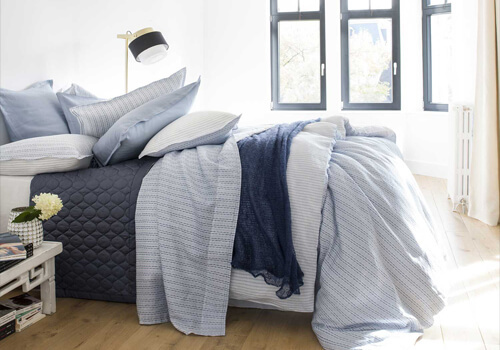 Our bed linen never irritates your skin, even for young linen, still rigid when you touch it. Linen provides an overwhelming softness. Naturally anti-dust mites and antistatic, linen maintains your health and accelerate the wound healing. The luxurious home linen collections from Alexandre Turpault will follow you, keeping its properties and its beauty, for many years. 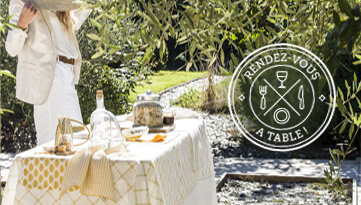 Discover our pure linen bed linen and table linen collection !